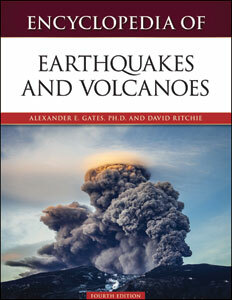 Encyclopedia of Earthquakes and Volcanoes, Fourth Edition provides a single-source reference on recent and historical earthquakes and volcanic eruptions for the student and general reader doing research on this high-interest subject. This comprehensive A-to-Z resource explains the specific terms, concepts, people, and organizations associated with the sciences of catastrophe—seismology and volcanology—and covers the places in the world where these destructive phenomena have occurred, as well as key environmental issues, economic dilemmas, ethical concerns, and current advances in research and technology. Alexander E. Gates, Ph.D., Virginia Polytechnic Institute and State University, is currently a professor and the chairman of Earth and Environmental Sciences at Rutgers University in Newark, New Jersey. He is also the executive director of the Highlands Environmental Research Institute and a Fellow of the Geological Society of America. He has served as president of the National Association of Geoscience Teachers (NE Section) and the Geological Association of New Jersey. He is an expert in many environmental aspects of geosciences, including environmental radon, earthquake activity, acid mine drainage, and soil pollution. He has appeared as an expert in several Discovery Channel documentaries, among others, on topics in geology and commonly appears in newspapers and on television news programs to explain the impact of earthquakes, pollution, and other environmental incidents on the public. David Ritchie is a professional journalist and author of The Ring of Fire and The Computer Pioneers.